"God is always teaching me more about who He is and who I am while I am out there. For me running is the ultimate school ground." - Ryan Hall talks openly about faith and his running as he gets ready for 3 weeks of training in Boston to prepare for the April 19th race. Coach Jay Johnson: What happened to just running? So I told my kid not to hit other kids at school and that fighting isn't the answer. *Freshman Jordan Hasay wins Stanford 1,500 Results and discussion as Hasay runs 4:14. *David McNeill!!! Aussie David McNeill crushed the field in a mostly solo effort, running 13:25 and closing in 2:32 for the last km. In other news, former U. Arizona star Robert Cheseret is now running for the US Army. Ryan Hall Talks With Running Times About His Faith And Running We give Hall a lot of credit as he talks sincerely about his morals and beliefs. WBZ Boston Catches Up With Low-Key Ryan Hall Training On Boston Course We'll see how Hall's non-existent racing schedule pays off in 3+ weeks. Boston Elites Robert Cheruiyot pulls out but Meb K remains only the 16th-fastest PR in the deep field. Virgin London Elites Biggest international superstars still heading to London. 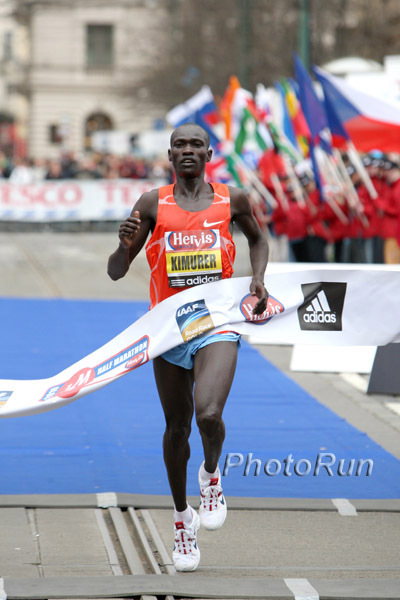 Prague H-M Results: Joel Kemboi (left) Wins By Over 1-Minute Marathoner Yemane Tsegay finished 3rd. Look Out For Eshetu Wondimu In This Weekend's Berlin Half Marathon Wondimu ran 59:53 for a half marathon several days ago despite falling halfway through the race. Help Elect Angela Bizzarri As Sullivan Award Winner - Vote Here Sanya Richards and amputee ultramarathoner Amy Palmiero-Winters are also up for the award for the top "amateur" athlete in America. Considering Richards makes hundreds of thousands a year, she shouldn't get it. WADA Looking For City To Host 4th "World Conference on Doping in Sport" WADA knows who to contact to reach people who care about drugs in the sport. US May Be Stripped Of 4th Olympic Relay Medal In '00 Decade They're going after the 2004 women's 4 x 400 team aided, like the other disgraced American relays, by the good folks at BALCO. UK's Mail Reports On IAAF Financial "Shock and Horror" IAAF is spending more money than it's taking in - trying to grow the sport while public interest is waning. Tyson Gay Will Race On Streets Of Manchester - But No Bolt Christine Ohuruogu and Jessica Ennis will also be out there, but Bolt will not return this year. Recommended Read: Ashton Eaton On Breaking The World Record Eaton says breaking the world record so unexpectedly could put too much pressure on his career. His coach Dan Steele says "no ego" is a key to Eaton's success. Brief Chat With US World Indoor Medalist Alysia Johnson Nobody expected Alysia Johnson to lead the world final, break 2:00 for the first time, and score a bronze medal for the US in Doha. UK Athletics And Dan Pfaff Lay Down Exact Replica Of 2012 Olympic Track For Technical Event Athletes To Train On Coaching genius Dan Pfaff was hired away from the US by Charles van Commenee. World Women Tune Up For London - Update Will Chicago '09 champion and former track star Liliya Shobukhova again triumph over distinguished marathoners Irina Mikitenko and Deena Kastor? Will a new African star finally emerge? Britain's TV Giants Bid To Show Bolt Diamond League Races Bolt does for track what Tiger Woods does (and will continue to do?) for golf television ratings. Liu Xiang Hoping For A Medal In 2012 But Says "It would be great just to get to the final." LRC The Week That Was We take a brief break from celebrating Cornell's ride to the Sweet 16 to give you an abbreviated "Spring Break Version" of our weekly recap. Along the way, we talk about Zersenay Tadese's world record, Mo Trafeh's sudden surge, Deena Kastor's fade, and wonder whether Jeff Risely owns Nick Willis. We cover all of last week except we purposely ignore the LA Marathon. IAAF Men's Preview: Wide Open Affair Last year's champ Gebre Gebremariam is back, but he'll face a slew of challengers, including Kenya's new phenom Paul Tanui (click here to see Tanui dominate the Kenyan nationals by 30 seconds), Uganda's great hope and last year's silver medallist Moses Kipsirio and others (Leonard Komen and Joseph Ebuya). Plus a Spanish dude even thinks he can win. IAAF Women's Preview: Can 3-Time Champ Tirunesh Dibaba Hold Off Kenya's Rising Star Linet Masai Masai came up just short last year but will be hard to beat this year. In the junior race, Dibaba's little sis will go for her third title. North Americans Can Bet On World Cross LRC voters are taking Kenyan Champ Paul Tanui in the men's senior race. Flashback: Wejo In Mombasa: Controlled Chaos Read about incredible one-of-a-kind 2007 World XC Championships in Mombasa, Kenya. Tens of thousands of people packed like sardines, hanging in trees, in oppressive heat, all to see the Cross-Country Championships for the first time in Kenya. There will never be a party like this one again. See Wejo's highly-praised photos. LRC Moses Kipsiro And The Legacy Of John Akii-Bua Kipsiro is Uganda's top runner and was the runner-up at last year's World XC Champs. Thanks to PJ Browne, we go behind the scenes to try to put a story and a face to Kipsiro so he is not just another nameless "African runner." Polish-Born Magdalena Lewy Boulet And Worlds Veteran Ryan Vail Named US Senior Captains NCAA team XC champion Ryan Vail just ran out of college eligibility but this is already his 3rd World XC Team. Kenya After The One Title It Can't Win Any More: Senior Men's Indvidual Title When the Kenyans talk about lack of success in XC, they generally mean one thing: not winning the senior men's individual title. Expect African Dominance In Poland As Zero Non-African-Born Seniors Finished Top 10 Last Year Shalane Flanagan is dubbed a medal contender on the women's side, but it'll be harder than medaling at the Olympics on the track. BBC Can't Get TV Rights For World XC They're trying to promote the sport in the UK leading up to 2012 Olympics but this is a step in the wrong direction. Recommended Read: Geb's Impact Extends Beyond Running Unfortunately, he may not be having much of a running impact any more, as his performances have been subpar of late. A Brief Chat With Mo Trafeh - The American Runner Everyone Is Wondering About Trafeh, the US's newest sub-61 minute half marathoner, talks about turning down coaching from Hicham El Guerrouj's coach, why he trains alone, and what he plans to do after his recent road breakthroughs. Bitter Welsh Marathoning Prospect Quits The Sport Teenager cites criticism of his 180 mile/week training as a reason he is switching to soccer. UK Athletics Expects 99 Medals From Paralympians It's like the runner who stops at 99 miles in a week. The Science Of Sport - Q&A On Barefoot Running Part 1 *Part 2 *Part 3 *Part 4 Almost every day, we answer questions from friends and acquaintances about the barefoot running push. Our friends at Science of Sport are hosting a lengthy discussion of the topic. LRC Can't Miss: Training Talk #6 With Craig Virgin Two-time World Cross-Country champion and two-time American record holder Craig Virgin joined us for Training Talk #6 and talked about a wide range of subjects, including his high school and college training, his time with Nike and Athletics West, racing 3 times in 4 days during a "front-loaded" career, and Jimmy Carter and the 1980 US Olympic Boycott that cost Virgin his best shot at an Olympic medal. Virgin is a true ambassador of US distance running and one of the greatest-ever US distance runners - whether you're looking for training advice, inspiration or entertainment, his stories and opinions are a must-hear.